On and off since the seventies, Tico Martini's little French factory has produced very successful racing machines for the lower formulae, especially F3. During the mid and late nineties, the Martini MK73 chassis paired with Opel Spiess power has proved a formidable force in French and German F3, racking up wins at the hands of Franck Montagny (who nearly missed out on the French title in 1998) and Wolf Henzler, a near winner of the 1999 German title. In the early seventies Martini produced his first successful F3 car, Ford power taking Jacques Laffite to the 1973 French F3 title. The team then moved on to F2 and soon hit the jackpot again, Laffite repeating his 1973 success two years later by lifting the European crown in a BMW-powered Martini. With Jacques moving on to Guy Ligier's new F1 team, René Arnoux was picked from the French F3 ranks to defend Martini's honours in 1976, now equipped with national Renault power. The little Frenchman was arguably the fastest man around but narrowly lost out to the more consistent Jean-Pierre Jabouille. The two rivals, both heavily backed by French oil company Elf, were to become team mates at the works Renault team at the start of the 1979 season. When JPJ set out to develop the Renault RS01 F1 turbo car, René had the F2 championship to himself in 1977 and kept faithful to the Martini team when it boldly decided to move into F1 in 1978. The mission turned out a disaster, however, Arnoux rarely getting in front of the last row on the grid. After missing the two South American races, the Martini season got off to a terrible start with a non-qualification at Kyalami, after which the team skipped Long Beach as well. Monaco was a likewise character-building experience, René unable to survive prequalifying. Finally, at Zolder, things looked better. 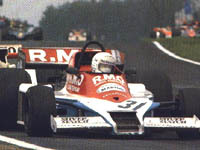 Arnoux qualified a fine 19th, making his and the MK23's race debut and finishing 9th. The picture was taken near the end of the race, with Giacomelli about to overtake Arnoux for 7th place. They each were to lose their place to Lunger's BS McLaren, though, who stormed past both of them in the wake of race leader and eventual winner Andretti - taking the new 79 to its debut victory. In the background we see Ronnie Peterson making it a double for Lotus. 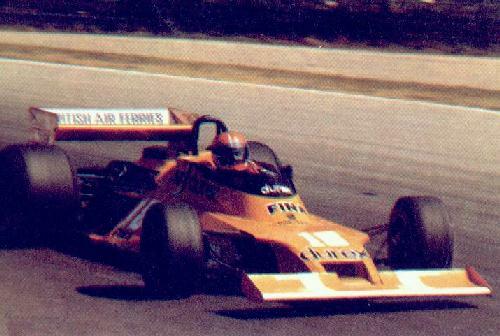 At the familiar Ricard track, Arnoux went one up in qualifying but in the race could not repeat his Zolder result. To make things worse, the team were put on the reserve list for Brands and weren't allowed to practice. The rest of the season was spent languishing at the back until at Zandvoort the car's rear wing mounting failed. That was the last to be seen from the team and with René a free agent he got himself two Surtees drives at the closing North American GPs, replacing Rupert Keegan and the Monza go-between Carlo Franchi, better known as 'Gimax'. In his four seasons at Renault (here seen in one of his worst moments at Zandvoort in 1982...) and two-plus seasons at Ferrari he stood out as a fast qualifier, scoring an amazing 18 poles, but often could not keep up his one-lap pace in race trim. Arnoux did however win 7 GPs and finished 3rd in the 1983 championship before falling from grace at Ferrari after just one race in the 1985 season, being replaced by Stefan Johansson after a dismal 1984. The gritty Frenchman returned in 1986 for four more years with Ligier, scoring points on occasion but never reaching the podium again. Nowadays Arnoux is co-owner of the DAMS F3000 and sportscar operation. Meanwhile, the Martini team did well to strike back in F3, cleaning up the European championship with Alain Prost in 1979 and scoring several national titles in the years after: the 1981 Italian title with Eddy Bianchi, the 1985 German title with Volker Weidler and a collection of French titles at the hands of Alain and Michel Ferté, Philippe Streiff, Olivier Grouillard and Pierre-Henri Raphanel. Jean Alesi, victorious for ORECA in 1987, is the last driver to win an F3 championship at the wheel of a Martini chassis.